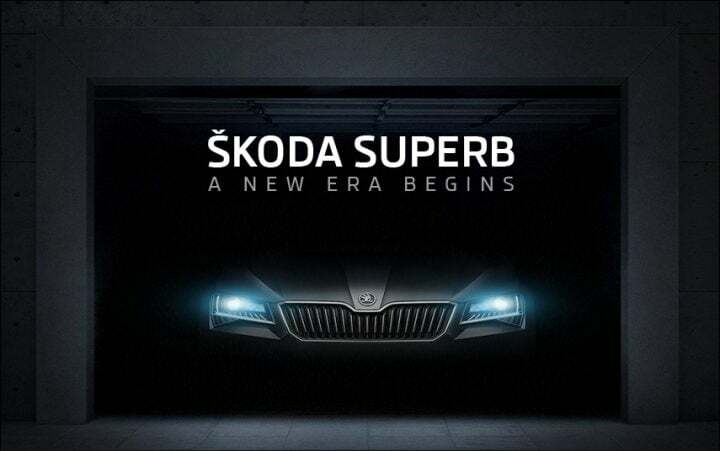 The ultimate luxury car of 2016 from Skoda, the new generation car revealed in Prague in 2015, is about to make its debut in India in Feb 2016. We are talking about the 2016 Skoda Superb, the ultimate car in the segment with space and features, which gives other luxury cars a run for their money. Skoda Superb has always been known for its perfect comfort features, especially at the rear seats, which spoil you for luxury. Based on the teaser images and videos revealed by the brand in past few days, here are our thoughts about the new 2016 Skoda Superb. On the exteriors, the Skoda Superb is an elegant car, which shouts premium and muscular from every angle. It has a bold and aggressive grille, attractive body-lines and modern design language. This car is a head turner on the road. It has the DNA of Skoda design which has a lot of substance and style to appeal of customers with an eye for class and luxury. Around the bold grille are sleek headlamps with DRLs which, not only make it look stylish but also add to the safety of the car. It is super-attractive on the outside and highly spacious on the inside. On the inside the new Superb is perfect on comfort and ultimate in space. Some of the key highlights, which set this car apart from most cars in the segment are a large panoramic sunroof for airy feel, ventilated seats at front for ultimate comfort, premium piano black decors with ambient lighting, 3-zone climate control system for occupant comfort, rear AC vents, smartlink connectivity with a 6.5 inch touch screen infotainment system for uninterrupted entertainment, 12 speaker canton sound system for a supreme audio experience, boarding spot lamps to name a few. Also there are many other creature comforts on the new 2016 Skoda Superb, which make it unparalleled in comfort. There is a “Boss Button” on the right side of the front passenger seat which can move and recline the front seat from behind so that you can adjust it without bothering the chauffer when you need to stretch your legs for extra comfort in the rear seat of this car. There is also 12 way power adjustable driver seat programmable memory function. These are some of the features you would find only in cars way above this segment. 2016 Skoda Superb fits the classy lifestyle of customers who seek luxury and fine things in life. Skoda likes to call it the “Best In Next Class” car for the discerning buyers! In its segment, Skoda Superb is a brilliant car with high brand value and robust build, two key reasons to pick Superb over any competing car. Summing it up, 2016 Skoda Superb is the ultimate in comfort, high on luxury, strong on street presence and offers a lot of substance, which impels achievers to choose one for them.